SMART Recovery group protocols, tools and activities are based primarily on cognitive behavior therapy (CBT), rational emotive behavior therapy (REBT), which is a form of CBT, and motivational interviewing (MI). While earning a master’s degree in counseling and subsequent work in the field, I was trained in CBT. As one of the many people hit with addiction who has also been hit with mental illness and trauma, I have been treated with CBT. CBT is an evidence-based practice for treating addiction. Reports like this one and this one question the primacy of CBT over medication-assisted treatment (MAT). However, I am a counselor, not a medical professional. To help people with addictions, I can offer CBT and the increasingly promising dialectical behavior therapy (DBT). That SMART Recovery employs CBT works for me personally and professionally. I had the remarkable experience of serving as a “client” for Albert Ellis himself, founder of REBT, at a conference in Tampa, Florida in 2003. My name was selected from a fish bowl and I proceeded to the front of the room and learned first-hand from him, directly but gently, about my awfulizing and catastrophizing. What I remember most is not what he said, but the fully involved and kind look in his eyes when he said it. While the tie between REBT and measures of addictions treatment efficacy – such as days abstinent, for example – hasn’t been studied extensively, REBT is well-documented as a useful therapy for emotional, mental and psychological problems. As with CBT, the inclusion of REBT as a basis of SMART Recovery is a fit for me. SMART Recovery does not claim to be a treatment, nor does it claim to be an evidence-based treatment. Rather, it claims its components are evidence-based which, according to my careful, informed assessment, seems true. Further, it welcomes study of its efficacy, stating on its home page, “Our approach…evolves as scientific knowledge in addiction recovery evolves.” While reports on SMART Recovery like this one and this one are primarily descriptive, a meta analysis was begun this year and this study moves closer to measuring the efficacy of the program as a whole. A study published in 2016 found that patients participating in SMART Recovery showed “highly significant” improvements in percent days abstinent and a reduction in drinks per drinking day. A 2017 study by Zemore et al. found that participants of SMART Recovery and other 12-step alternatives were more satisfied, with more group cohesion than the participants of 12-step groups. Zemore et al.’s findings mean that, despite the prevalence and cultural emphasis on 12-step groups, alternative groups are equally or more effective than 12-step groups at providing social support for people in recovery. Given that 12-step approaches have been studied for decades, with no causal link emerging between 12-steps and abstinence, a support group that is informed by and responsive to latest science is a welcome addition to the field of addictions treatment. SMART Recovery was named as a recovery support service (RSS) in Facing Addiction in America: The Surgeon General’s Report on Alcohol, Drugs, and Health, released in November, 2016. I feel personally and professionally confident in both participating in, and serving as a volunteer in, SMART Recovery. Laurel Sindewald contributed to researching this post. Unbroken Brain: A Revolutionary New Way of Understanding Addiction braids together three narratives: Maia Szalavitz’s personal story, what the science reports about addiction, and a call to action to change belief-based addictions treatment to evidence-based treatment. Prior to the release of Unbroken Brain, Maia Szalavitz shared these images about the myths surrounding addiction and the science that refutes them through her Twitter stream. Myth #1: There is an “addictive personality” that all people with addiction share. People with addictions are more likely to have higher levels of certain traits like impulsivity or anxiety, however, not all addicted people have all of these traits and no single “addictive personality” has ever been found. Further, extremes on either end of the personality spectrum – like fearfulness and recklessness – can both increase risk. Myth #2: Once an addict, always an addict. Conventional wisdom has it that addictions are always a lifelong struggle. But in fact, half of people with illegal drug addictions overcome their problems by age 30 – and many do so by cutting down, rather than quitting entirely. Myth #3: Addiction is an “equal opportunity” disease. Not everyone is equally at risk. Addiction typically kicks people who are already down or who have unstructured or otherwise difficult lives. It is far more likely to affect people who have mental illness, those who have suffered severe childhood trauma, people with personality disorders and those who are poor and marginalized (although it is probably more common in the extremely rich who have more unstructured time than the middle class, as well). Myth #4: Babies can be “born addicted” to drugs. Infants can be born with physical dependence on drugs like heroin or pain relievers if their mothers take them daily during pregnancy. But newborns cannot be addicted, even though they can suffer withdrawal. Addiction requires knowing that the drug is what you need to fix your symptoms, as well as being able to obtain it repeatedly and then taking it despite negative consequences. Myth #5: Addicts have “hijacked brains” and are powerless over their behavior and unable to learn until they stop taking drugs. While much of addictive behavior seems irrational, no one deliberately shoots up in front of the police or in court – and people with addiction clearly plan and work hard to ensure their drug supply and avoid detection. On the other hand, they do all this hiding and planning in order to gain access to something that is harmful for them. This means that people with addiction can have impaired decision-making abilities, but they are not zombies without free will. While addicted, they can and do take important steps to protect their health like learning to use clean needles and how to reverse overdose. Here’s a transcription of the text in these images (.pdf). Maia Szalavitz has written extensively in multiple publications on how addiction myths are contradicted by the science of addiction. 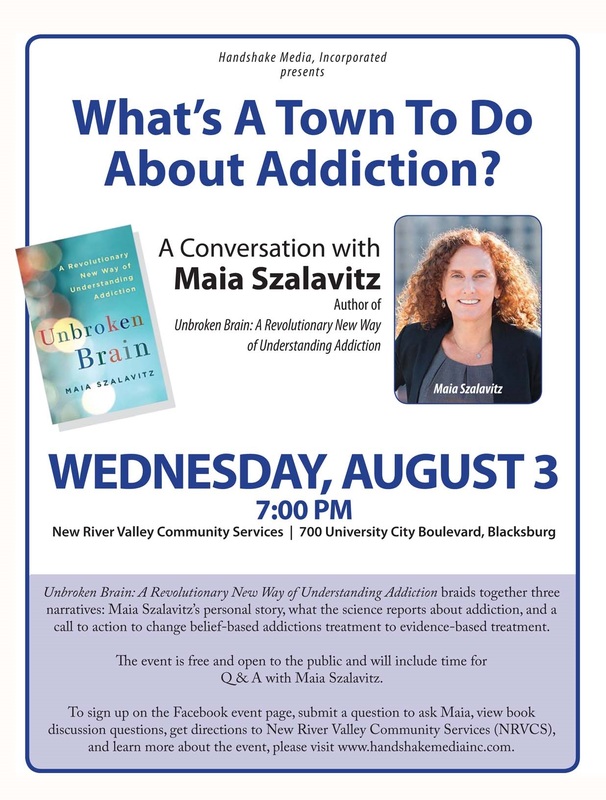 Maia Szalavitz, author of Unbroken Brain: A Revolutionary New Way of Understanding Addiction, has graciously agreed to speak in Blacksburg, Virginia on Wednesday, August 3, 2016. UPDATE: Video and transcript are here. No time to read Unbroken Brain prior to the event? Here are our top picks from her most recent publications. Read Author to lead conversation on the science behind addiction by Luanne Rife for The Roanoke Times. Unbroken Brain braids together three narratives: Maia Szalavitz’s personal story, what the science reports about addiction, and a call to action to change belief-based addictions treatment to evidence-based treatment. Want to share the event flyer? Here’s a .pdf. Here’s a .jpg. The author will be available to sign audience members’ previously purchased copies of Unbroken Brain after the conversation. Here’s a link to multiple ways to buy Unbroken Brain prior to the event. Let’s expand this list of recovery resources in the Blacksburg, VA area for the estimated 16,000 in our area with alcohol and other drug challenges. If you would like more information about Maia Salavitz’s visit to Blacksburg, Virginia, please contact Anne Giles. Maia Szalavitz will give a public lecture on drug addiction at The University of Virginia’s College at Wise in Wise, Virginia on Thursday, August 4, 2016, 6:00 PM at the Banquet Room in Cantrell Hall. The lecture is free of charge and open to the public. Persons with family members or loved ones with addiction are especially invited to attend. For additional information, contact Hugh O’Donnell, 540-395-3926 or 540-762-0590. Let’s continue the conversation after Maia Szalavitz’s visit to Blacksburg! We’ll gather for a community book discussion of Unbroken Brain on Wednesday, August 31, 2016 at 7:00 PM in the Community Room at Blacksburg Library, 200 Miller Street, in Blacksburg, Virginia. We invite you to prepare for a lively discussion by considering these questions. No time to read the book? Read Anne’s top picks from Maia’s most recent publications. Try a selection from our curated list of her recent publications. Read 5 Addictions Myths Challenged by Maia Szalavitz in Unbroken Brain. If you’ll sign up on the Unbroken Brain discussion Facebook event page we’ll know how many chairs to set up! Here’s a list of Maia Szalavitz’s most recent publications and interviews. Maia Szalavitz writes currently and extensively on the science of addiction and on public policy regarding addiction. Here’s a list of questions for thought about Unbroken Brain. Maia Szalavitz updates her Twitter stream frequently with commentary and links to science-based news on addictions (and cute cats!). If you would like more information, please contact Anne Giles. In 1996, Blacksburg, Virginia was deemed the Most Wired Town in America. In the 20 years since, the Town of Blacksburg has made dozens of “best of” lists for business, retirement, living and learning. My dream for Blacksburg’s next accolade? Most Recovered Town in America. Why in the world would we want or need such a designation?! We have our street festival, Steppin’ Out, just around the corner! We’re fine! Right? We’re fine. Aren’t we? Over 16,000 people 18 and older in the New River Valley area have alcohol and other drug problems. According to local officials I’ve interviewed, the majority of local criminal and traffic cases involve substance use. These numbers include a larger trend in Virginia, considered epidemic in the U.S., involving opioid addiction. We, like other towns in the U.S., are not fine. The state hardest hit by the opioid crisis, West Virginia, is right next door. What would be the “end in mind” for the “Most Recovered Town in America”? How would we know if we had achieved that end? To begin to answer those questions, Handshake Media, Incorporated is honored to present “What’s a Town to Do About Addiction? A Conversation with Maia Szalavitz, Author of Unbroken Brain: A Revolutionary New Way of Understanding Addiction” at 7:00 PM on Wednesday, August 3, 2016. In Blacksburg, Virginia, we’ve been reading Maia Szalavitz’s Unbroken Brain: A Revolutionary New Way of Understanding Addiction, since it was released two months ago on April 6, 2016. To prepare for Maia Szalavitz’s visit to Blacksburg, we’ll gather for a community book discussion of Unbroken Brain on Wednesday, June 22, 2016 at 7:00 PM in the Community Room at Blacksburg Library, 200 Miller Street, in Blacksburg, Virginia. If you’ll sign up on the June 22 Facebook event page, we’ll know how many chairs to set up! For more information about Maia Szalavitz’s visit to Blacksburg, Virginia, please contact Anne Giles. At Handshake Media, our vision was to share the voices of our community through our own podcast channel and to help members of the “who can podcast” list below to set up their own podcast channels. We offered podcast production services for about 3 months with no takers, however. We’ve learned from previous ventures that if our labor force is small and our budget minimal, if we don’t have early adopters very early, we won’t be able to sustain a “wait and see” approach. Anyone with a message, in other words, can podcast that message to the world. – Why Would You Podcast? I have a feeling that local interest in podcast channels may follow a similar pattern to that of blogs. When I started Handshake Media in 2008 and pitched blogs and sharing blog posts through social media, the return on investment of sharing the story of an organization or business – not just descriptions of its products or services – was hard to sell. Will blogs and social media really be used for marketing? That was the question I was asked in 2008. Do people really listen to podcasts? Will podcasts be used for marketing? That’s the question we’re being asked in 2016. We shall see what the answer is. In the meantime, we’ll need to stop offering podcast production services. We appreciate everyone who met with us and considered our services. We’d like to, however, offer up our extensive market research and thoughtful business model conception on podcast production services for anyone interested. Perhaps our work can help others move this idea forward in ways we weren’t able to. Because we think members of our community have voices and ideas the world needs to hear. Feel free to follow the links below and to study, copy and paste as you would like. Feel free to contact us if we can answer any questions or be of service in any way. If Charles Dickens were alive today, this pioneer of the “serial publication of narrative fiction” would be podcasting and we’d be waiting to listen to each installment of his story like we do for the next Harry Potter book. Because you’ve got a story to tell and you can tell it with your own voice. BBC’s podcast, The Forum, published an episode just last year titled The Power of the Human Voice, discussing and demonstrating the influence of the human voice in communication and identification. In this episode, The Forum interviews three guests. Peter French, a professor and an internationally recognized expert in voice and acoustic forensics, speaks to the qualities and components of voices that can be isolated to track down and identify criminals. He also agrees with Anna Devin, an opera singer who shares how the human voice provides a spiritual connection, an almost primal, emotional connection in a way that is not yet measurable, and therefore unstudied by science. Diana Deutsch, their third guest, speaks to the importance of intonation in public speakers, and that intonation alone can affect an audience just as much as the content. As a listener, I was struck by how personal their accounts felt, and marveled that the format of their conversation felt far more interesting, inclusive, and engaging than it would have had I merely read their interview. In interviewing Peter French, Anna Devin, and Diana Deutsch in a podcast, The Forum demonstrated the power of the human voice even as they discussed the topic. Podcasts have taught me that I would rather listen, in many cases, than read. In fact, many people learn best by listening, and these people will be more likely to remember your message if you deliver your content as recorded audio. Other people struggle to see, with either full or partial blindness, and these members of your audience may appreciate audio content even more. Podcasts also extend your reach by making your content accessible to people who are too busy to sit down and read. Podcasts and audiobooks are gaining in popularity, because they leave their audience free to drive, exercise, or do chores while listening. Podcasts, like other forms of content marketing, allow you to build rapport with your target market as a company or professional who provides value, even before people buy in as customers. Unlike other forms of online marketing, podcasts allow you to reach your market even after they leave their online devices behind. Listeners will often download podcast episodes to listen to later, on iPods or other mobile devices. Wait lists for medication-assisted treatment (MAT) for opioid addictions treatment can be months long, especially in rural areas. While opioid addiction is considered an epidemic in the U.S, patients struggle to access and then to pay for medications known to support opioid addictions recovery. Buprenorphine is a partial opioid agonist used in maintenance therapy for opioid use disorders. As is methadone, buprenorphine is an evidence-based treatment for opioid use disorder. Buprenorphine has been shown repeatedly to improve treatment outcomes more than behavior therapies (Clark et al., 2015; Bart, 2012) and more than abstinence-based treatment. On July 8, 2016, Substance Abuse and Mental Health Services Administration (SAMHSA) and the US Department of Health and Human Services (HHS) published new regulations for MAT in the Federal Register, allowing doctors to prescribe up to 275 patients at a time. In order to do so, doctors must have credentials in addiction medicine or addiction psychiatry from a specialty medical board or professional society, or work in a qualified practice setting providing comprehensive MAT treatment. These regulations will be effective on August 7, 2016. While the Mental Health Parity and Addiction Equity Act of 2008 requires health insurers to cover behavioral health services, this does not extend to MAT. Not all insurance plans cover buprenorphine, and in some cases doctors insist on payment in cash. If a patient has no insurance, the requirement to comply with counseling adds an extra expense that may be prohibitive. Some states set limits on how long patients may be treated with buprenorphine. The SAMHSA guidelines for treatment with buprenorphine state that some patients may require many years, or even life-long maintenance. Some states set age restrictions on who can receive buprenorphine. In Virginia, no one under the age of 16 is allowed to take the medication. This is clearly not because people under 16 never develop substance use disorders. The 2014 SAMHSA National Survey on Drug Use and Health reports that 1.3 million adolescents aged 12-17 had substance use disorders. This means 5% of adolescents, or 1 in 20, met the criteria for a substance use disorder in 2014. 168,000 of these adolescents were addicted to pain relievers, and 18,000 were addicted to heroin. Opioids produce tolerance in people over time, which means their bodies no longer respond to the drug as strongly as before. As tolerance develops, people take higher and higher doses of opioids to get increasingly lessened effects. If people with opioid use disorders are abstinent, their tolerance drops. This means if they relapse, they may try to take the kinds of high doses they had been used to, and so are likely to overdose and die. As only a partial agonist, buprenorphine and methadone do not produce highs in patients who have, already, developed tolerance to opioids. Rather, these medications are designed to stabilize opioid levels while patients rebuild their lives, staving off withdrawal symptoms as well as cravings, and reducing the risk of lethal overdose. When talking about MAT, we must be clear about our values and objectives. Above all, MAT is a non-punitive approach to opioid addiction recovery. Abstinence may be wished for, but in the meantime, treatment providers are hoping to reduce disease risk, crime, and death. Lessons from the AIDS epidemic may be helpful in understanding and implementing best practices quickly. A recent pilot study indicates that buprenorphine dosing while patients are waiting for comprehensive addictions treatment significantly reduced illicit opioid use, including intravenous use, compared to patients on wait lists who did not receive buprenorphine. Even without additional addictions treatment, buprenorphine seems to be effective. The authors suggest that their findings could be especially useful for treating people with opioid use disorders in rural areas where treatment is hard to access due to limited transportation. Latest science indicates that incarceration and punishment are ineffective, even harmful. Yet this did not prevent drug courts from lobbying against Human Health Services’s efforts to increase patient limits to 200. Fortunately, their efforts were not successful, and we may see patient limits increased in the near future. The question remains whether patient limits should be imposed at all. In other areas of medicine, we trust doctors to limit their patient load to what they can effectively handle. We still trust doctors to prescribe painkillers, like hydrocodone and oxycodone, without restriction of dose or patients. Not that we should begin imposing arbitrary restrictions on other aspects of medicine. It is simply time for government to recognize addiction as an illness requiring treatment, not punishment, and that sometimes treatment includes medications such as buprenorphine. With millions of Americans addicted to opiates and close to a million still left without treatment, a 200 patient limit may not go far enough to ensure people get the treatment they need. Meanwhile, people are dying while they wait. The opinions expressed here are the authors’ and do not necessarily reflect the positions of Handshake Media, Incorporated, its associates, clients, or vendors.